Patricia Smith is the Founder of the Compassion Fatigue Awareness Project© and Healthy Caregiving, LLC. As a certified Compassion Fatigue Specialist with more than 20 years of training experience, she writes, speaks and facilitates trainings in service of those who care for others in all of the helping professions. With a background in journalism, Patricia’s writings have appeared in numerous publications, including the San Jose Mercury News where she was a correspondent for more than 20 years. As training and development manager for the Humane Society Silicon Valley, she created and implemented a critical shelter-wide compassion fatigue project. Her work in this field led to presenting workshops nationwide as a consultant for American Humane, a national organization advocating for children and animal rights. Currently, she is a consultant for the American Society for the Prevention of Cruelty to Animals (ASPCA) in New York and has assisted in creating a nationwide compassion fatigue program for leadership and staff. Her seminal book, To Weep for a Stranger: Compassion Fatigue in Caregiving, is a comprehensive look at compassion fatigue, its causes and symptoms, and how to begin the healing process. 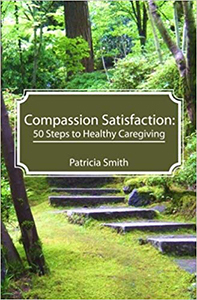 Her book, Compassion Satisfaction: 50 Steps to Healthy Caregiving, guides readers through 50 steps toward authentic, sustainable self-care and compassion satisfaction. She is the recipient of the “Excellence in Writing Award” presented by the National League of American Pen Women. Under her direction as Program Director, Ronald McDonald House at Stanford received the 2005 “Best Bets” award for its “Healing Arts” program. She was awarded the 2006 Telly Award for her script “Invaders of the National Parks, a documentary on invasive species created for the National Parks Service. Additionally, Patricia is a Helen R. Whiteley Scholar and has twice been awarded writing scholarships sponsored by the University of Washington, Seattle. She resides in Friday Harbor, San Juan Islands, WA.